This 90- km long peninsula comprises a world of diversity. Friendly towns and villages, spectacular mountains, a multitude of bird species nesting on treacherous cliffs, beaches of sand and pebbles popular among horsemen and rock skimmers, remnants and relics scattered here and there of times and ways of life long past. Saga sites and hiking trails.The Snaefellsjokull National Park is at the westernmost part of the peninsula, including the mystical glacier Snaefellsjokull, as well as other unique sites such as Djupalonssandur, Thufubjarg and more.In 2008, the communities of Snaefellsnes Peninsula were the first in Europe to receive certification from Green Globe, an international benchmarking system for sustainable travel and tourism. Though Grundarfjörður is not the most well-known town in Snæfellsnes, its mountain is certainly one of the most famous mountains in Iceland, if not the world. It is not unusual for photographers from all over the world to make their way to Grundarfjörður for the sole purpose of photographing this unique landmark which has even starred in a number of films. The swimming pool with its hot tubs is just one of a number of exciting services around the town. There is also a golf course, a family restaurant, a hotel restaurant, a coffee shop, information centre, horse rentals, a pharmacy, a liquor store, a dry cleaning and laundry service and a well-stocked grocery store. 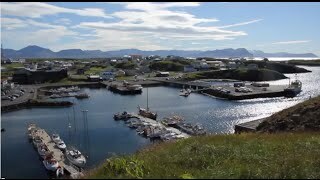 Hellissandur was once a major fishing centre but Rif was one of the main trading ports on Snaefellsnes peninsula. Most of the villages' fishing fleet is now based at Rif. These two villages are only 2 km apart. The Maritime Museum at Hellisssandur has displays that include Iceland´s oldest rowboat, built in 1826. The area between Hellissandur and Rif is a bird-lovers' paradise and one of the largest arctic tern nesting areas in Iceland. Snaefellsjokull National Park is on the doorstep of Hellissandur. From Reykjavik City Centre to Hellissandur:195 km. Hotel, camping site, restaurant, cafés and museum. Stykkishólmur is located by Breiðafjörður Bay on the north of Snæfellsnes peninsula, and is surrounded by wonderful views of the innumberable islands. One of the defining landmarks in Stykkishólmur are the old houses which reside in the old city center and this is reflected in the atmosphere – it sometimes feels like a place from a different time. In 2008 Stykkishólmur was presented with a planning award in part for its renovation of the old houses. The town and its inhabitants have systematically rehabilitated the houses, and they have gained new and exciting purposes – what once was a library is now an art installation, a fish packing house is now a restaurant, the old recreation center is now a volcano museum! The church in Stykkisholmur is an fascinating architectural structure. It makes a beautiful landmark both from land and sea. The view from the church over Breidarfjordur is spectacular. Stykkisholmur is, as we mentioned above, known as the gateway to the innumerable islands of Breidafjordur bay, which is renowned for its natural beauty and remarkable wildlife. We have plenty of ways to explore these sight on different levels via kayaking and tour boats of all sizes. Stykkishólmur boasts of a great swimmingpool, that includes an indoor and outdoor pool, a large water slide and hot tubs with water with healing properties certified by the Institut Fresenius. In Stykkishólmur we have open wi-fi access for tourists, numerous hotels, youth hostels, bed and breakfasts, a large camping site and a 9-hole golf course. In Stykkishólmur everyone should be able to find a restaurant to their liking as there is not only many of theme here, but they also cater to diverse tastes. Within the city center you can visit three unique museums: The Volcano museum, The Library of Water and The Norwegian House. The Library of Water is an istallation of 24 glass columns, by the artist Roni Horn, containing melted ice from some of the major glaciers around iceland. The glass colums refract and reflect the light onto a rubber floor embedded with a field of words that concern with weather, water, words and identities. The Norwegian house serves as the regional museum for the Snæfellsnes area. The house has been renovated back to it original style, with an open storage on the top floor. Rotating exhibiton as wrll as a museum shop with handicraft, sweets, coffee from the area. Stykkisholmur has been the frontrunner in environmental consciousness in Iceland and along with the four other municipalities on the Snaefellsnes peninsula it is the first community in Europe to get the EarthCheck environmental certification. The town is operated in as environmental friendly way as possible continually measuring various environmental indicators. The town was also the first municipality in Iceland to start fully sorting its waste as well as the first town in Iceland to receive the prestigious Blue flag eco-label for its harbour, and has been an European Destination of Excellence (EDEN), since 2011.